In her posthumously published book, Cinema and Experience, Miriam Bratu Hansen named her opening chapter on the German critic Siegfried Kracauer, “Film, Medium of a Disintegrating World.” Hansen writes that Kraucauer, unlike Walter Benjamin and Theodor Adorno (the book’s other two intellectual protagonists), sought to discover “the antidote to modern mass culture within mass culture itself,” optimistically holding out for film that acted as “material expression” of the social disintegration epitomized by fragmented urban experience. In other words, the city lives in you—which can be taken either as a psychological insight or a call to action. The Situationists placed great strategic importance on the unpredictable drift through the city in the quixotic hope that by turning upside down one’s image of the city you might actually change the situation of modern experience (and the Occupy Wall Street demonstrations are spreading). Many have since realized filmmaking’s potential in materializing a new architecture of the city, returning us to Kracauer’s early dream. These sources were on my mind as I previewed some of the films featured in next week’s “Radical Adults Lick God Head Style” Cinematheque program. The mostly short subjects navigate urban space in different ways, though all might be taken as lessons in applied psychogeography. They follow cracked compasses with a resourcefulness that often seems closer to foraging than location shooting. After watching several of them at home, I set about my usual Berkeley walk and in short order came upon a huge pile of VHS discards. All of the tapes had been marked in bold marker as “BLANK.” Would I have caught this wink without having first been absorbed by the “Radical Adults” filmmakers’ zigzagging? Somehow I doubt it. Of the films being shown, Ching Yi Tseng’s 724 14th Street is perhaps most firmly anchored in place. Aside from a couple of fleeting self-portraits and images of familiar San Francisco Victorian windows, however, “home” registers as the view rather than the room. Tseng studies the action and forms on the ground below, occasionally focusing upon small quotidian dramas but not with any greater emphasis than she gives to the tilting textures of the street in sun and rain. All is viewed through a pane of glass and silence. Stuttering time-lapse photography smears lived time, while the refractions of the same view in different light suggest the residue of many months in observing: you watch it and think this is what a year feels like. In The Image of the City, Lynch writes about the way that landmarks contribute to a city’s “legibility.” What 724 14th Street powerfully demonstrates is that private landmarks can work towards a different kind of reading. Water pooling on an opposing roof, the abstracted arrows painted on the streets, and criss-crossing MUNI lines all develop into pivotal features of a fragile landscape—fragile because the only thing holding it together is Tseng’s presence as a tenant and observer. By refracting these strands of perspective, she engineers a sense of familiarity and suggests a blueprint any of us might follow in crystallizing our own perches. The drifting of Douglas Katelus’ fragrant lyric, Lost in the Flood, initially seems to have a more familiar bohemian flavor, with a camera-eye surfing Valencia Street’s night tides before eventually setting out an elusive cross-country journey. And yet I take the final shot of daylight bleeding through the blinds of a darkened house as offering some suggestion that all that we’ve seen is some kind of daydream, radiating out from an absent center of stillness. In any case, some of the fugitive impressions contained in the film—a blood-red drive across the Golden Gate Bridge, a lonely sunset falling upon an old brick building—stay in mind as spare evocations of a wandering soul. There is a general lack of human activity in the visual field, but the soundtrack conjures familiar voices. 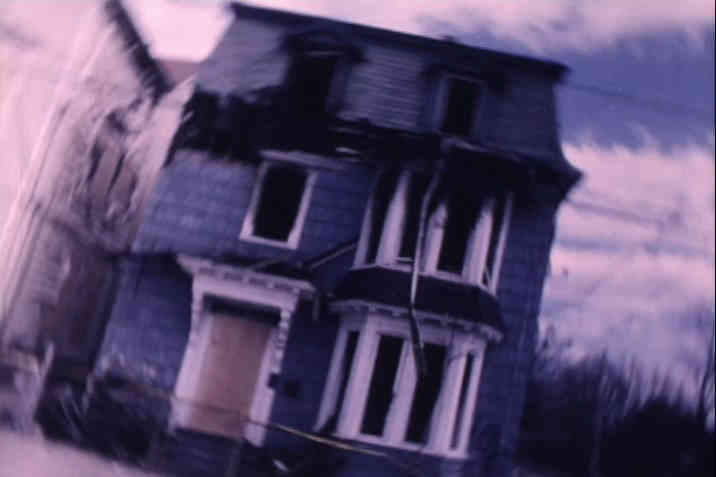 A fluid sequence cut to Lou Reed’s “Temporary Thing” is sandwiched between perambulations set to readings from Dylan Thomas’s “A Story” and “The Crumbs of One Man’s Year.” The Lou Reed portion splits the frame into four quadrants using unslit 8mm film stock to feature paired sets of images. The technique recalls Nathaniel Dorsky’s 17 Reasons Why (1987), though I was also reminded of Sol LeWitt’s captivating photo grids of the variations in quotidian surfaces (sewer grates, for instance). Katelus’ disembodied film conjures the same gravitation towards the hidden order contained in a narrow slice of actuality. Alee Peoples’ Lonelyville tours foreclosed houses with a guide who provides data of the housing market’s collapse. In this sense, the film is a good deal more concrete than the others, and yet it’s wiggier as well, as if actively pursuing the financial equation opens the door to free-associative improvisation. “I keep finding things. New threads…new cracks…new trash…new TVs on the sidewalk…people don’t understand why they don’t work anymore,” a voiceover whispers between conspiratorial talk of secret powers and tree house refuges. As with Lost in the Flood, Peoples goes in for fast motion walks, toppled camera angles, and multiple musical inputs. Here these distortions register less as subjective impressions than as passwords to access the city beneath the city: Providence giving way to Lonelyville. The records on the soundtrack are often stuck in a groove, playing at the wrong speed or else just sampling brief (yet distinct) instrumental passages. Peoples isn’t trying to make the city legible, to use Lynch’s term, so much as making shadow puppets in the dark lamp of neglect. There’s a nice surrealist shot in Lonelyville that pictures everyday pedestrians walking backwards while a stranger trudges forward as if against a stiff wind. The effect is achieved simply enough, but it produces a very precise graphic image of being out of step. Stephanie Barber and Xav Leplae’s wild collaboration razor’s edge expands upon the idea of using sight gags as a means of creatively reorienting a disused city (in this case Baltimore). With its long takes and extreme recessive staging, razor’s edge takes it upon itself to remap the city as a stage; the film plays like a strange, gluey mixture of Playtime and Jackass. Barber and Leplae embody the concept of drift, frequently to comic effect. They dance on high rooftops, act out drunkenness in a cavernous parking lot, and appear as freshly landed extraterrestrials in the neighborhood barbershop. The quality of being “out of place” is actively sought and elaborated upon. Towards the beginning of the piece, they two sit opposite of each other in a Korean restaurant doing the mime equivalent of Newton’s third law. In the foreground, a table of diners eats seemingly unaware of the act. This “normal” table is framed so that its edges form strong diagonals leading to Barber and Leplae in the center-depth of the shot. The space of their performance held in taut geometric tension with its social context even as it stretches across a disorienting length of time. The spine of razor’s edge is a gliding series of lyrical panoramas of narrow houses. It’s a familiar vantage, but the filmmakers stick with it for long enough to register the varying signs of activity and desertion, beauty and poverty, the weeds and kiddie pools and clotheslines and fences evoking a jungle’s density. At times the deep shadows of the buildings throw the camera into darkness, and it is difficult to tell whether it is day or night. I find razor’s edge alternating currents intriguing, though the film’s cryptic tactics will doubtlessly alienate some viewers. Learning that it was made with the faint memory of W. Somerset Maugham’s The Razor’s Edge in mind won’t clear anything up, but those willing to suspend expectations may find that Barber and Leplae have reconstituted urban space a playground. Instead of plugging gaps with pop music, they sing to themselves. THE COMPLETE LINEUP: Scotch Tape (1963) by Jack Smith; Lonelyville by Allee Peoples; I know something is going on back there by Gibbs Chapman and Catherine Lam; 724 14th Street by Ching Yi Tsing; Lost in the Flood by Douglas Katelus; Crowning Glory by Allee Peoples; razor’s edge by Stephanie Barber and Xav Leplae.